I've been refreshingly busy doing stuff I love the last couple of days. Photo shoots last night as well as this morning, the latter of which took place in Golden Gate Park on a picture-perfect (and cold) day. I even took some time after the shoot to walk around the Botanical Gardens, one of the true perks of living in San Francisco (residents get in to the enormous gardens for free). Since then I've been kind of ineffective, but hey, it's almost Christmas ... and Christmas, to us, means leisure time. 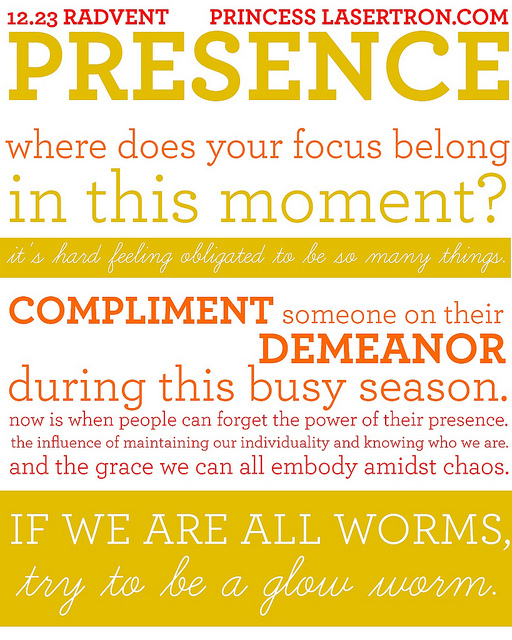 It's funny that as I begin to write about presence, I have very little of it. After I finished with my second shoot in 12 hours this afternoon, the rest of my focus seems to have melted away. Fortunately, though, as I keep reminding myself, now my focus should remain at home, and my to-do list suddenly seems less important. I admit, we're pretty lucky in that we get to relax over this holiday. We traveled over Thanksgiving, and I just got back from Boise, and now it will just be us. I've left Christmas Dinner planning to the last second, of course, but that's to be expected ... I do it every year. I am really grateful to be in this present moment, even if I keep doing ridiculous things like writing half of an item on the grocery list ("laundry deter") or leaving the dryer door open, or sitting on the couch not moving for hours. It's so important to be aware of and grateful for the present. After all, it's really all we have.